Labels are applied to your garments during the checkout process, but you'll first need to upload your labels to your Brand Profile. Your labels will be printed using the same method as for any DTG printed garment, so your print files will need to be of the same quality (300ppi PNG in RGB, find out more here). To upload your label print files, log in to your Inkthreadable account and head to your Brands page. Click the Add new brand button, or the Edit brand button if you've already started setting up a brand profile. Tip: Creating a brand profile will add packing slips to your orders. These are free of charge and can be customised to match your branding. You'll see four tabs at the top of this page. The first two relate to setting up your packing slips, so skip past these (unless you want to set these up now too, if so this will guide you through it) and head to the Labels tab. Uploading your labels is as easy as clicking the Upload button and selecting your labels from your computer. You can add them one at a time, or in bulk by selecting multiple files at once. You can even drag and drop into the specified area. To save yourself a little aggro later we'd recommend you rename your labels to make it obvious which is which. You can upload as many labels as you need for each brand you create, which is handy since we recommend steering clear of printing dark labels on dark products and light onto light. Your labels can be any colour! 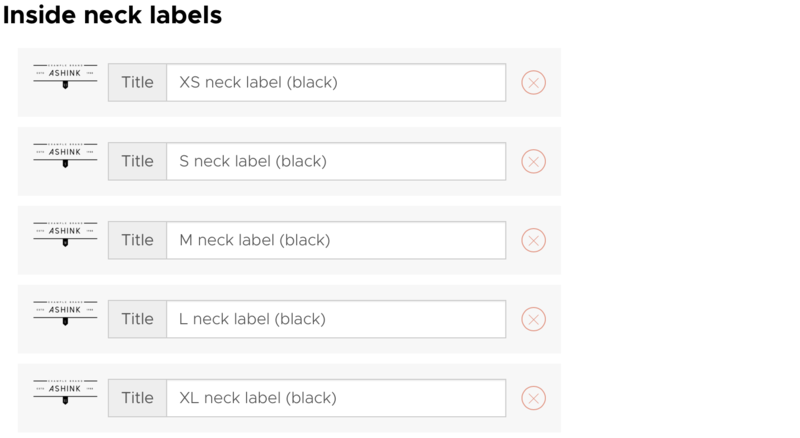 But remember, we can't print black on black, or white on white, so creating and uploading variations of your neck labels now will save delays in the future. 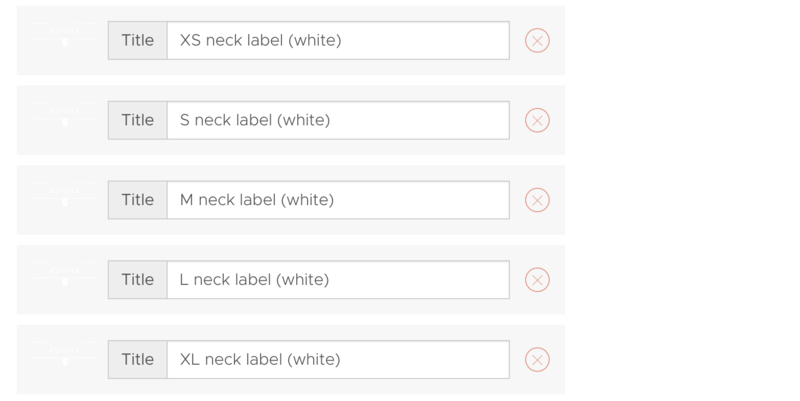 Labels are assigned to your products before adding them to your basket. They're not saved to garments, you'll need to add a label each time you're placing a manual order. Working this way means you only need to upload each label once, and you can delete/upload new labels by simply returning to your Brand page. To add your DTG neck labels, first head to your Products page. This is where you'll add products to your basket to place manual orders. 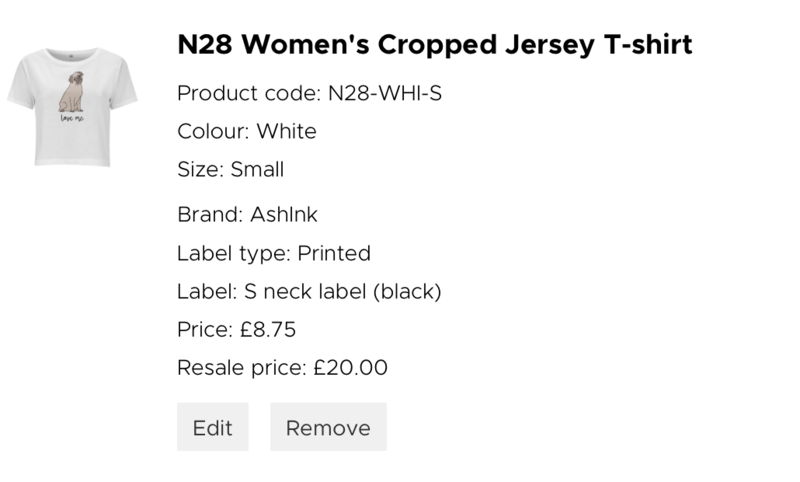 Select the product you'd like to order, then use the drop down menus on the product page to select your garment size and the corresponding neck label you'd like to add. As you can see, all of the labels previously uploaded to the Ashink brand are now available to select from the label list. There are no previews of each label, so naming each individual label to something easily recognisable is important. You can also add a resale price to your garment before it's added to your basket. If you enter the price your customer has paid in this field, this will be displayed on the packing slip sent to your customer. Navigate to your basket when you're ready to place your order. You'll see the options selected on your product page appear listed beside each product in your basket. Take a second to check these details are correct, because if not you can amend them by clicking the Edit button. Remember: Adding a DTG label to your garment will add £1.51 (inc. VAT) to the total cost. If you're happy with your order details, go ahead and click the Checkout button to complete the order process.